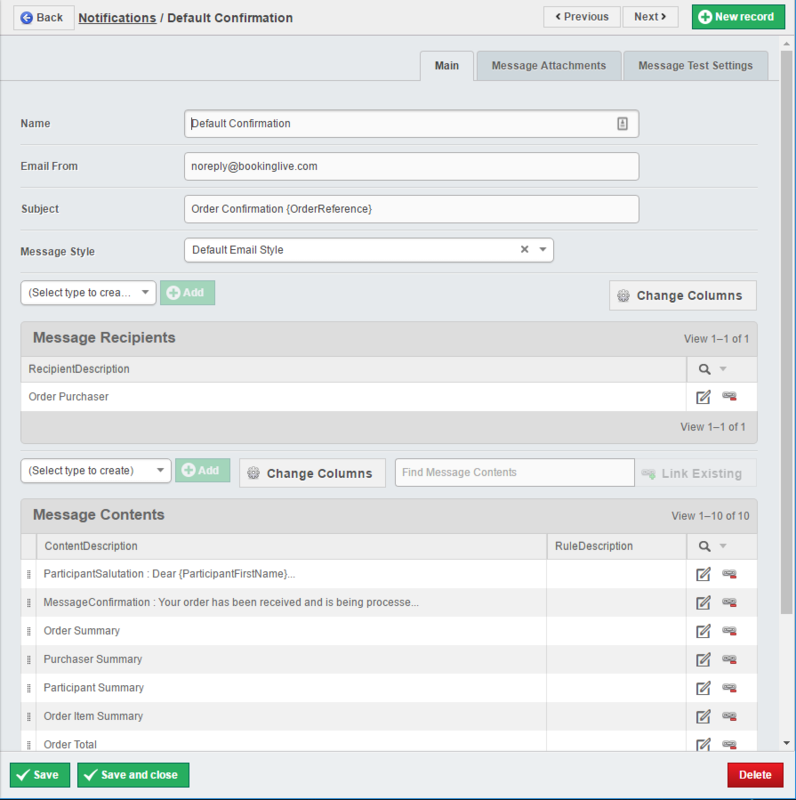 The Email Message system built into Booking Live allows you to automatically send confirmation messages, reminder messages and other messages to your customers via Email. These can be set up to send automatically via usage of the Timeline. 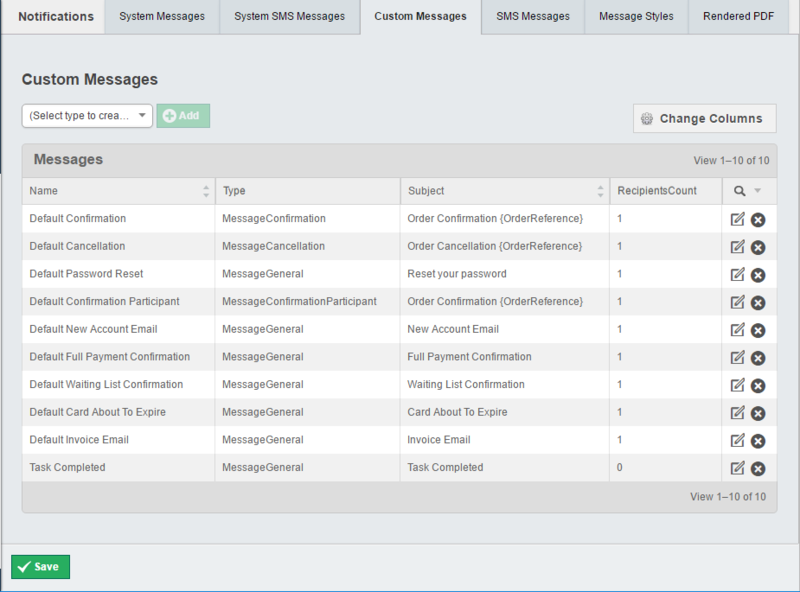 If you have created additional messages (see below for details), then you can select which message is used through the use of the Dropdown field for each system message. Here, you can see the list of all currently existing Email Messages on your system. To edit an existing Email Message, click on the Edit link to the right of the message. To create a new Email Message, click on the (Select type to create) menu to the top-left of the table. Select the relevant type of Email Message (Message General is the most common), and then select Add button. 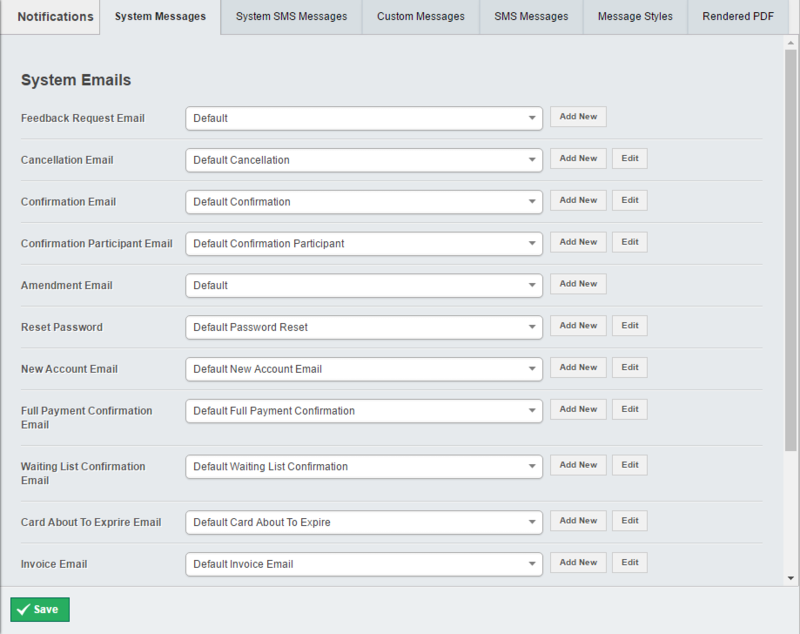 This screen shows the settings that are available for editing or creating an Email Message. The above example displays the Default Confirmation message. Used to link files to an e-mail, see below for details. Used to test the output of an Email, see below for details. When you include a new Recipient, you can define if they will be in the To, Cc or Bcc lines of the Email. To add in a new Content Block for the Email Message, you need to select the relevant content item from the dropdown list (Select type to create) and then click on the Add button. With most of the Content Blocks, after you click Add, you will then need to click Save and Close to add it to the Email Message. You can re-order any of the Content Blocks by clicking and Dragging the icon to the left of the Content Block. To edit the Message Contents, you will need to click on the Edit icon to the right of the Content Block. Note: Some content blocks cannot be edited, except for Message Rules. 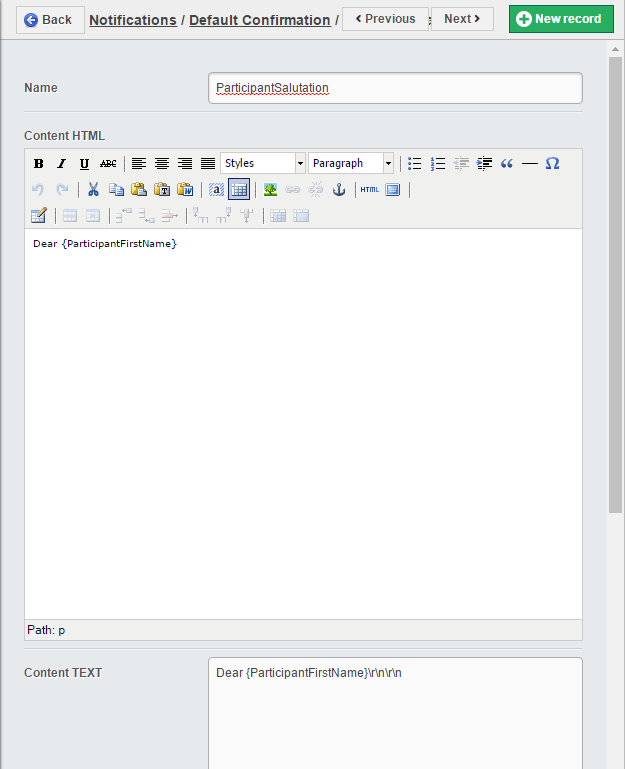 A Rich Text Editor to allow you to create formatted content. It is possible to set validation rules for when this particular Content Block will be included in the Email Message. These rules can be added by going to the Message Rules section of the Content Block, selecting the relevant content item from the dropdown list (Select type to create) and then click on the Add button. Include information from any Custom Booking Form Fields.